The Ally Coalition and Above Average are joining forces to create a unique live experience for fans at SXSW, featuring music, comedy, variety and a whole lot more. 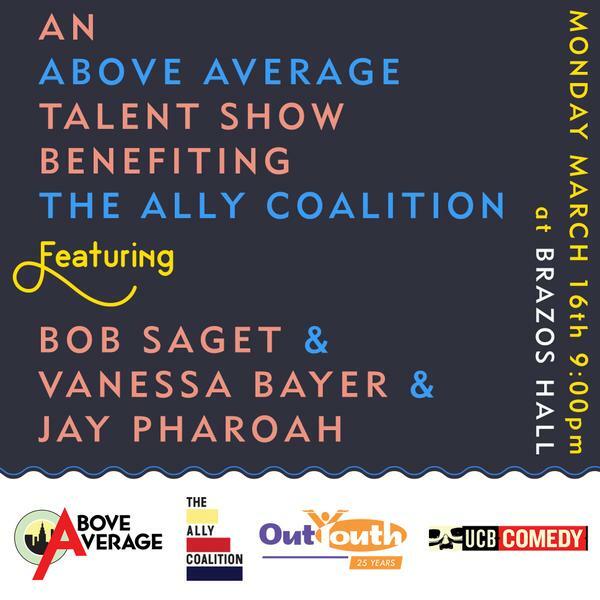 Previously, The Ally Coalition and Above Average have teamed up in support of Equality for benefit shows during The New York Comedy Festival, NYC PRIDE and our first “Talent Show” on Giving Tuesday, raising over $20,000 for New Alternatives, a service provider for LGBTQ homeless youth in New York City. We will be working with Out Youth in Austin, a nonprofit organization that supports and provides services to lesbian, gay, bisexual, transgender, and questioning youth ages 12 to 19 in Austin and Central Texas. OutYouth offers peer support groups, counseling, educational programs, social activities and community outreach. The SXSW Interactive event will feature a mix of stand-up and sketch comedy, music and variety performances. Through social media contests, on-site activation and on-stage performances, the event will engage fans toward becoming part of the solution.